White Rose Potatoes. About 8-10 for a group of 8-10 people. Boil potatoes until they are done, then test with a fork. Combine all of the above in a very large mixing bowl, gently fold the ingredients. If you are storing in the fridge for the night you may want to go easy on the Mayo and add a tiny bit more before the event. Van Kamps pork and beans – for a large group use two of the tall cans, for a smaller group, and you will want leftovers, use one tall and one of the shorter #2 cans. Add salt, pepper, mustard (the yellow French’s), and molasses. You will need to do these by taste and color. Cook the bacon until nearly done then add the onion and cook until the onions are translucent, then drain the fat. Poor the beans into a bowl and remove the piece of pork that will be in the beans. Add bacon and onion mixture. Pour the mixture into a bean terrine (if you have one) or into a casserole dish and bake for at least one hour at 350 degrees. If you like, cook longer until the surface gets the way you like it. If you aren’t lucky enough to be tailgating, then you at least will be happy to be at home with your blender to make this awesome drink from Teresa Howes, the author of Skinnytinis. Don’t forget to join us on twitter at 7pm ET to talk all things tailgate. Usetweetchat to follow along with #SundaySupper. Okay the salad and beans and everything looks amazing! Love it! Baked beans and potato salad are both some of my favorites. Yum! I’m up for trying that drink!! And can you really go wrong with tater salad and beans? I think not. YUM! Looks like the perfect potato salad and game day tailgate menu! See you at #sundaysupper on twitter @fromagechick! I love that you shared with us recipes from actual tailgating memories with your dad! The potato salad sounds like one I would really like…and the beans too. This post is full of all kinds of good stuff! Mixing baked beans and potato salad? Brilliant! And that watermelon drink looks incredibly refreshing – the perfect drink to wash this salad down with. Baked beans and potato salad are perfect for tailgating! Thanks for sharing Kristen! Hey I am a San Diego girl and loved going to the Padres games!! Now I am in WA but still a fan. Great recipes!! I will take the watermelon drink, my husband the potato salad and my daughter the baked beans. We are then all very happy!! WOW! You have the whole tailgate meal! What time is food being served? I’ll be over! Welcome to #SundaySupper! Beans AND potato salad! Two of my favorite BBQ sides–love having them together too–this looks awesome! I also like my potato salad with mustard! The idea of the beans contrasting the potatoes sounds really good! 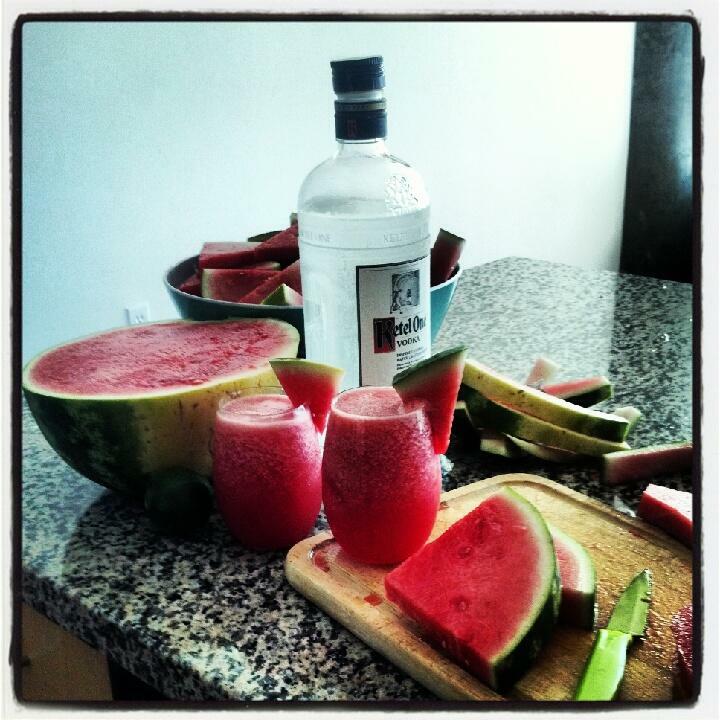 The watermelon and vodka was a great way to end the post. Now I’m thirsty too. 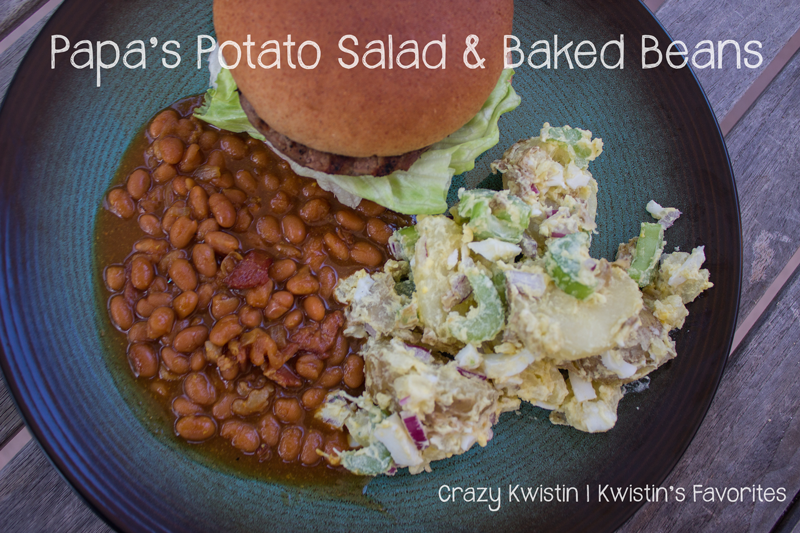 Love both baked beans and potatoes salad! Thanks for sharing! Great story and recipe. That watermelon drink looks fab too! I went to a conference in San Diego once and one of the other attendees asked me if I liked baseball and wanted to go to a game while I was in town. I didn’t realize until I arrived that she was the sister of the owner of the team! I got to sit in the owner’s box, take a tour of the stadium and the Padres’ official photographer took my photo on the field. Oh, and I also got to touch Tony Gwynn’s bat! So cool. This potato salad recipe sounds so easy and makes me want to try. baked beans and potato salad indeed are a match made in heaven. They should never be seperated! I’m a sucker for potato salad and my hubby likes baked beans so this would be a great combo for us! becaause I stumblerd upoln iit foor him… lol. So allow mme too reword this…. topic here oon your website.